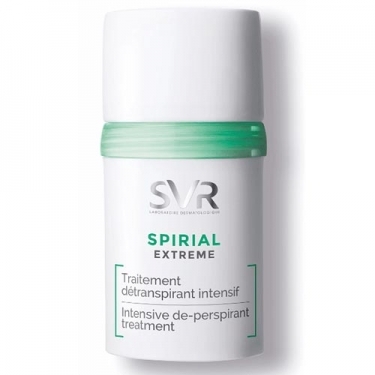 DESCRIPTION: Spirial Deo Roll On Extreme from SVR is a deodorant that fights extreme sweating, as it can be particularly challenging for those who have an active lifestyle, and can be triggered by factors such as stress, exercise, or during the taking of certain medications. Regulation of excessive sweating with maximum tolerance. This antiperspirant is perfectly suited for the most sensitive skins, yet has a high concentration of active ingredients with a perspiration-inhibiting action. Its innovative formula allows this care to have an efficacy without equal, thanks to an antibacterial agent, which acts on the skin flora preventing the formation of unpleasant odors; self-regulating complex consisting of aluminum chloride and sesquichlorhydrate, which is present in a concentration 2x higher than that found in classic antiperspirants; niacinamide, to protect and soften the skin. Without perfume. Apply to clean and dry skin for 3 consecutive days in the morning or evening. Wait a few seconds for complete drying before dressing. Apply 2 to 3 times a week in the morning or evening. If desired, you can also switch with your usual deodorant.